The SS-Polizei-Division was activated on 1 October 1939, and one component in that division was SS-Artillerie-Regiment 4. This book focuses on this particular artillery regiment, as well as SS-Flak-Abteilung 4 . . . Unfortunately, due to sales rights restrictions, we cannot offer 6516: Ss-Artillerie-Regiment 4, Ss-Polizei-Division: A Study Of German Artillery for sale in your country. The SS-Polizei-Division was activated on 1 October 1939, and one component in that division was SS-Artillerie-Regiment 4. This book focuses on this particular artillery regiment, as well as SS-Flak-Abteilung 4 . . . yet it also offers much more! This volume also serves as a general study of German SS and Army divisional field artillery in general, and modelers and military historians will be entranced by the variety of weaponry on display. The book covers the unit's early war involvement in the invasion of France and occupation duties, before moving on to Operation Barbarossa, the invasion of Russia. Later in the war, the unit served in the Balkans, before finally fighting its way across northern Germany in the face of the ferocious Russian onslaught, and its final surrender to American forces at the Elbe. The detailed text gives helpful background information about the unit, while captions yield a mine of information about the weapons, equipment and vehicles found in artillery and Flak units. The artillery pieces that are covered in detail include 10.5cm and 15cm howitzers, plus the rare 10cm long-range gun, while the Flak anti-aircraft guns include the legendary 8.8cm, and the smaller 2cm and 3.7cm pieces. The black and white photos yield much information and detail about how German artillery was employed in WWII, with inspiring photographs taken during combat and training. There are numerous useful views of the gun crews, ammunition, towing vehicles, and of course, the guns themselves. 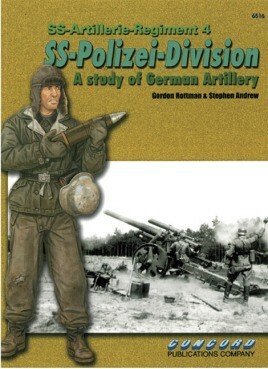 This book is the perfect companion and resource for those who are seeking inspiration for a modeling project, or who simply wish to learn more about German artillery and their operational practices. The balance of photographs and authoritative commentary contained within this book ensures that it is one that should not be missing from the military enthusiast's bookshelf!